Lewis Anthony Dexter may well have been one of the better known and least appreciated political scientists of the last century. This outstanding collection of Dexter's writings, demonstrates why Dexter remains important. The volume off ers solid reasons for researching the topics Dexter pioneered, and is a masterful guide to his thought and analyses. Dexter's writings derive from a multifaceted career. 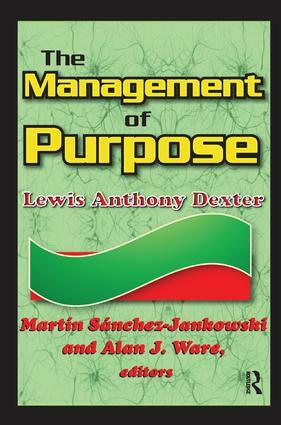 The Management of Purpose is organized into three broad subject areas: sociology, political science, and practicing social science. Dexter's notions of what constituted sociology and anthropology and his understandings of these areas and how to use them to illumine political matters are unusual. His use of multiple types of evidence, including history and logic, enables him to make significant contributions to the study of society's response to social problems. His work on labeling theory shows that social labels have a power that both transcends and distorts reality. Dexter was also a pioneer in the interactionist perspective, linking the labeled and those doing the labeling, and in demonstrating how organizations tend to compartmentalize and specialize. Dexter's work provides the analytic tools to enable readers to better understand many of the issues that remain a part of the American political landscape.